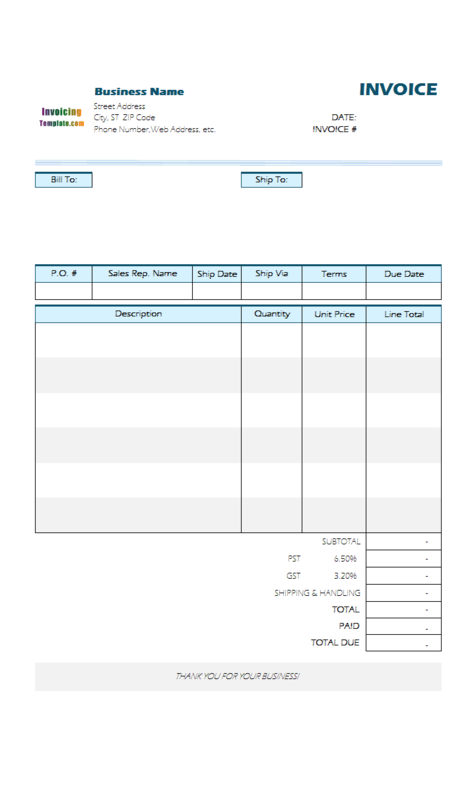 This sample shows the detailed steps required when adding new lines to an existing template, by using the default invoice template shipped with Invoice Manager for Excel (namely Uniform Invoice Software) as the starting point. 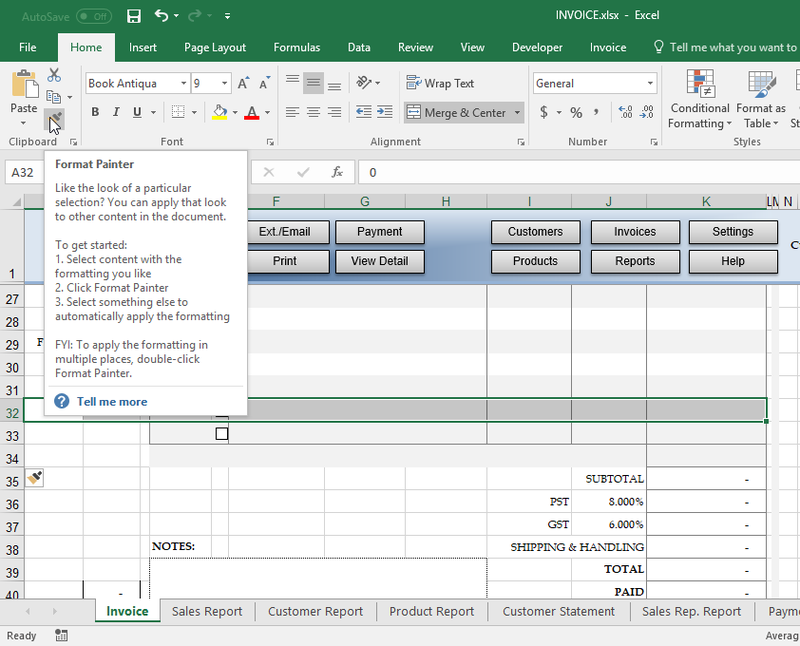 c5124 now includes the customized invoice template for the latest version of Invoice Manager for Excel. This is what you will see when you open tutorial-for-adding-new-line.xlsx. 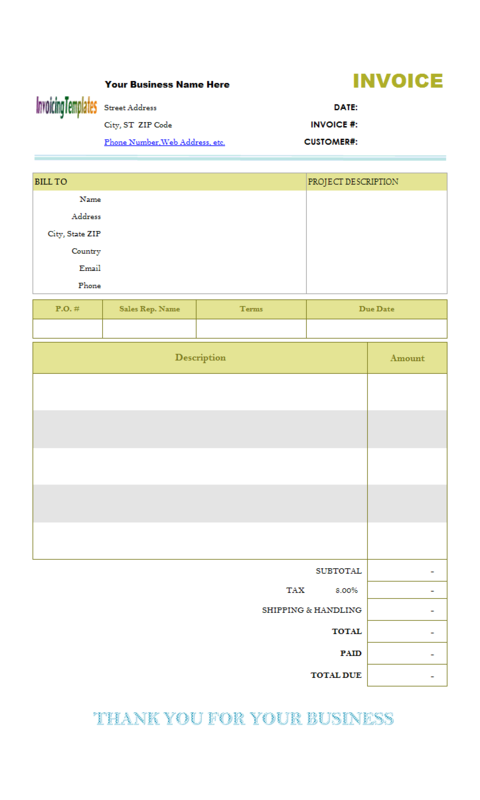 For example, Invoice Template with Long Product Description includes only 6 lines, which enables you to enter long text into the "Description" field. 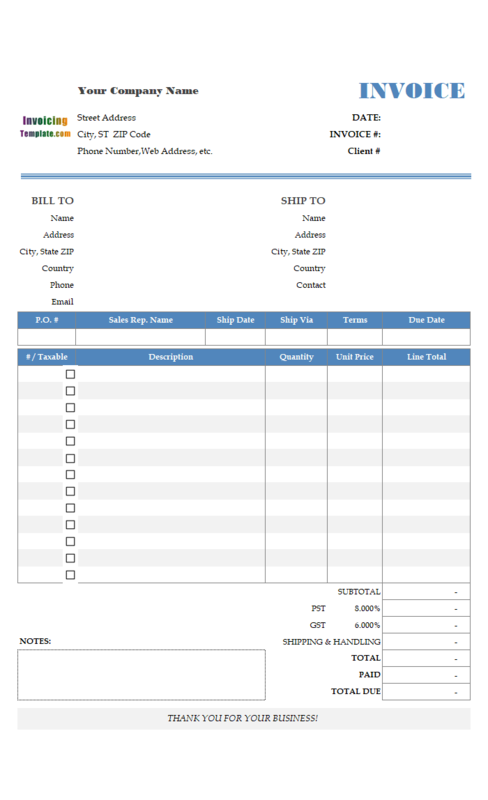 On multiple-page invoice templates, you can find samples that has 36 lines (two-page), 60 lines (three-page), 84 lines (four-page). 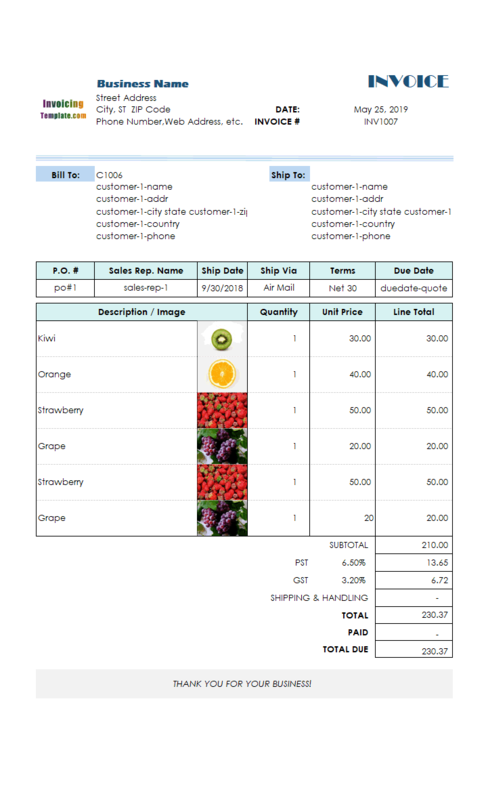 Reducing the number of lines could be archived by hiding some bottom lines of an existing invoice design, but increase the number of lines is not as easy as reducing lines. First, all cells that need to be saved to database must be correctly named, including those put into hidden columns. 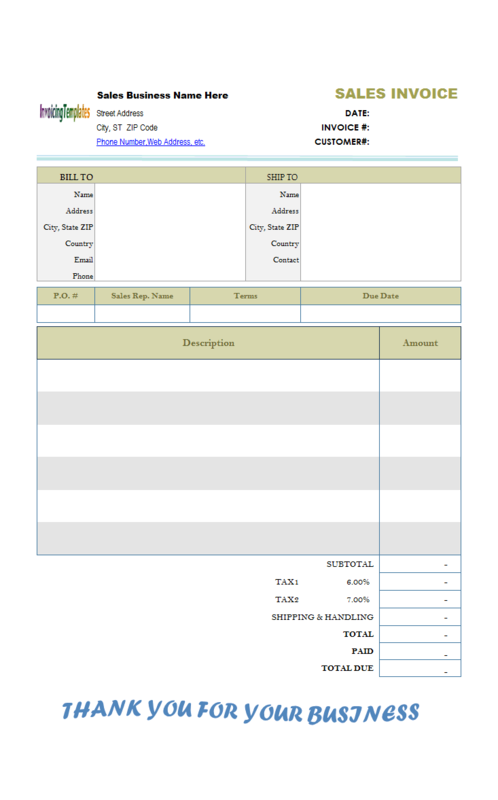 Secondly, you have to modify the Excel formulas that calculate totals and taxes. Finally, if you find many lines, you have to adjust the page breaks if the template should be printed using multiple pages. 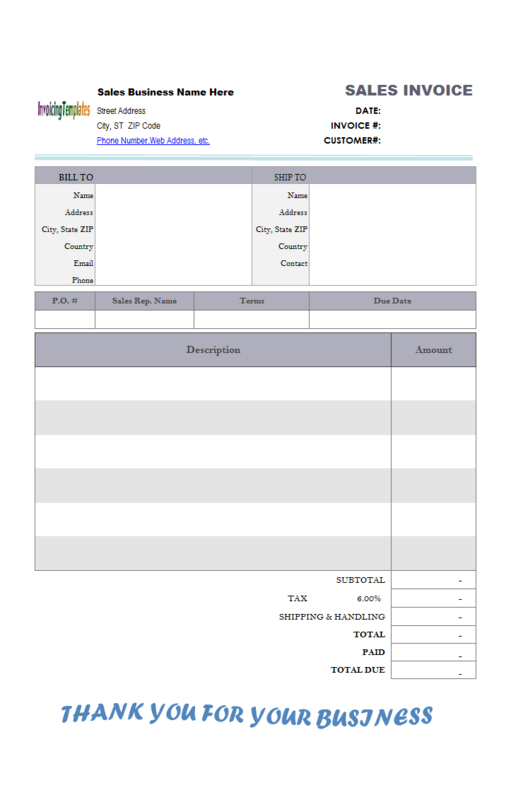 Switch to design mode by pushing down the "Design Mode" button on the "Invoice" ribbon tab. 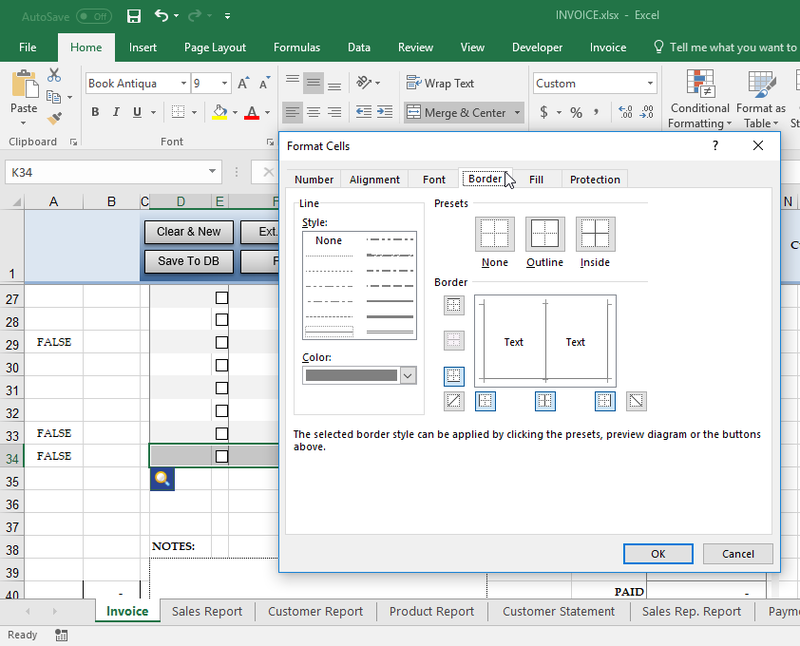 This shows Excel gridlines and row / column headings. Point your mouse to the left-border of the heading cell of column C. Drag it to right to unhide column B. Repeat this step to unhide column A.
Right-click the row 34 heading cell and choose "Insert". This inserts a new row. Drag your mouse to select all cells on row 32, ranging $A$32:$K$32. Click the "Format Painter" button in the "Clipboard" group of the "Home" ribbon tab. 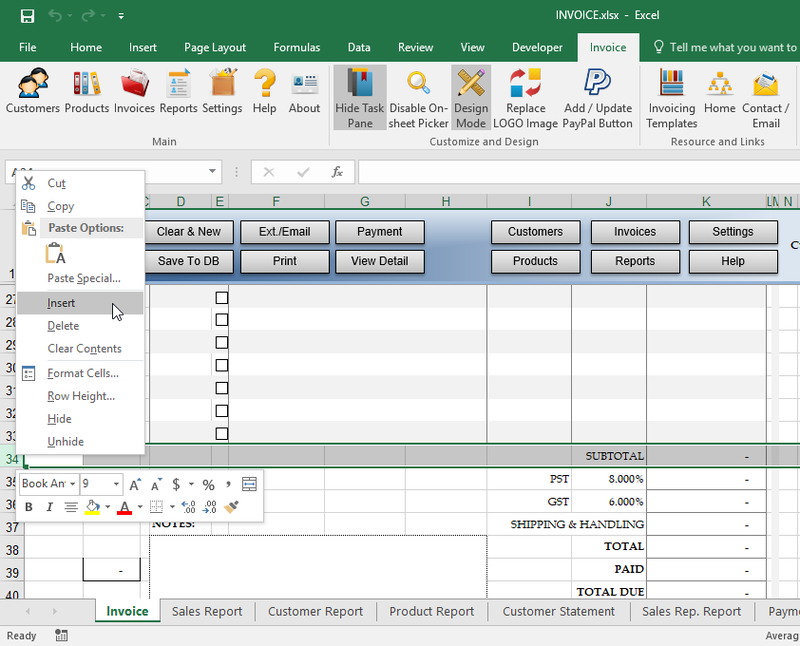 This copies the formats of the selected cells on row 32. 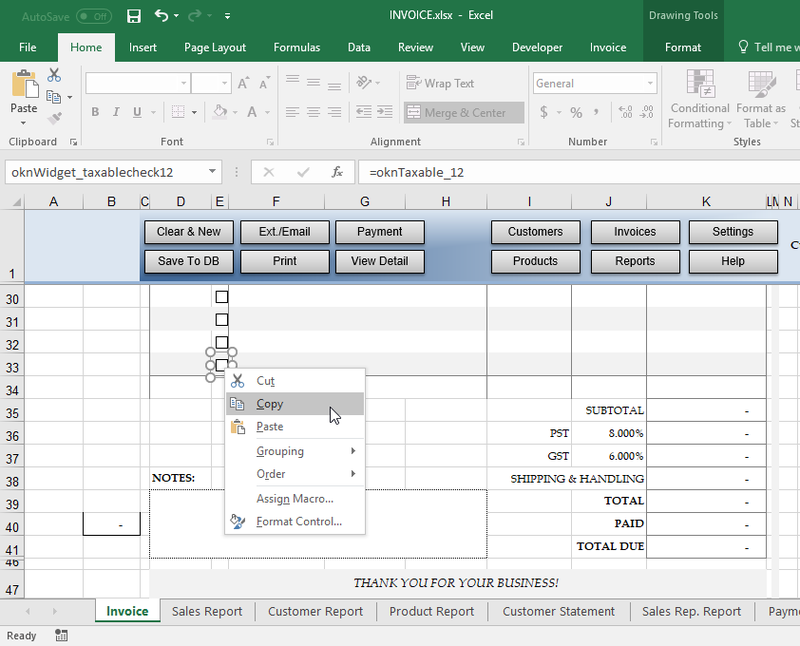 Click the first cell of the newly inserted row i.e. $A$34. 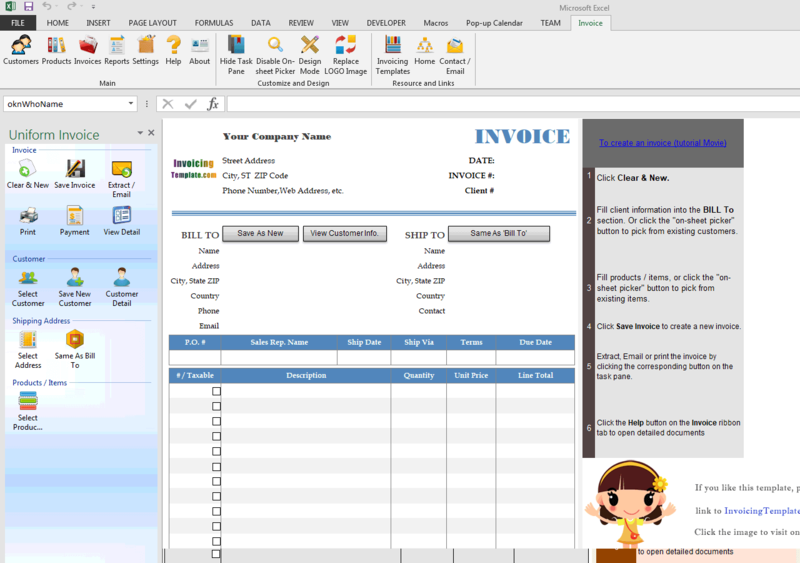 This applies the format of row 32 to row 34, including background colors, merged cells. Name the cells of the new row according to the name pattern of the above row. For example, $A$33 is named "oknTaxable_12", so $A$34 should be named "oknTaxable_13"; $B$33 is named "oknCost_12", so $B$34 should be named "oknCost_13". Please refer to How to name an Excel cell / range. The Excel cell names map to database file name. So for example in the name "oknProductID_13", "okn" is the prefix that must be added to all names that indicate cells saved to / loaded from database; "ProductID" is the database field name in the "Invoice Body" database table; "13" is line number. Right-click the "Taxable" checkbox on row 33 and choose "Copy" from the shortcut menu. 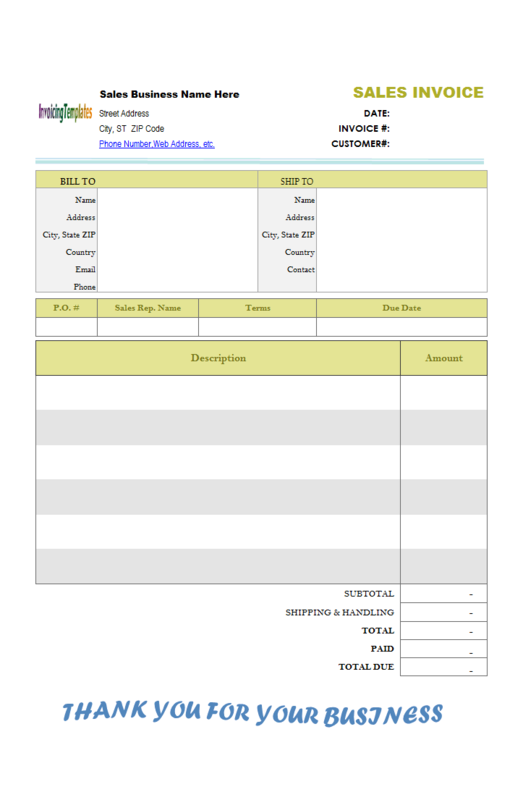 Click to select the cell where you want to put the new "Taxable" checkbox, i.e. $E$34. Right-click the cell, choose "Paste" from the shortcut menu. This creates a new "Taxable" checkbox by pasting the one copied from $E$33. 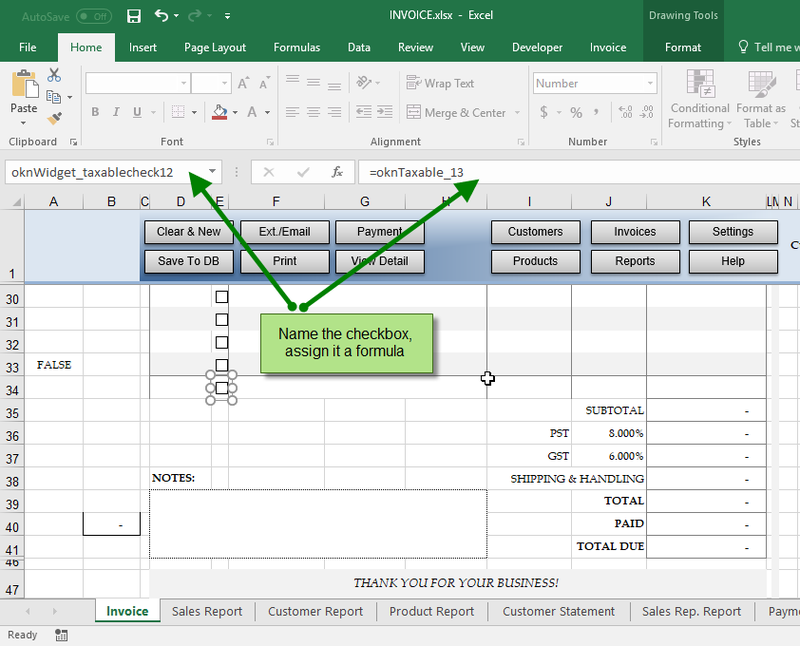 On Excel formula bar, name this new checkbox "oknWidget_taxablecheck12", assign it this formula to bind the checkbox to the cell named "oknTaxable_13". Drag your mouse to select all the printable cells on the newly inserted line, ranging $D$34:$K$34. Right-click one of the selected cells, choose "Format Cells". On the "Format Cells" dialog box, go to "Borders" tab. Set the borders as needed. Fine tune borders and colors as needed. Hide column A and B. 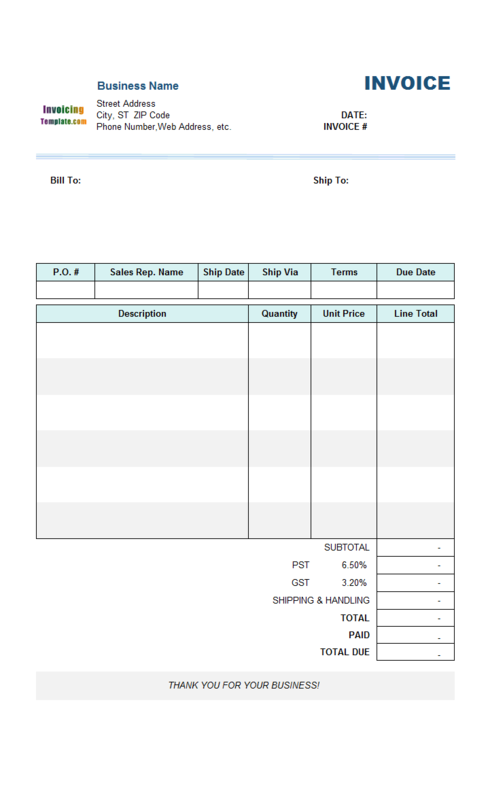 Since we add only one new line to the template, it is still printable one a single A4 or letter paper. In practical situations you may want to add several lines. 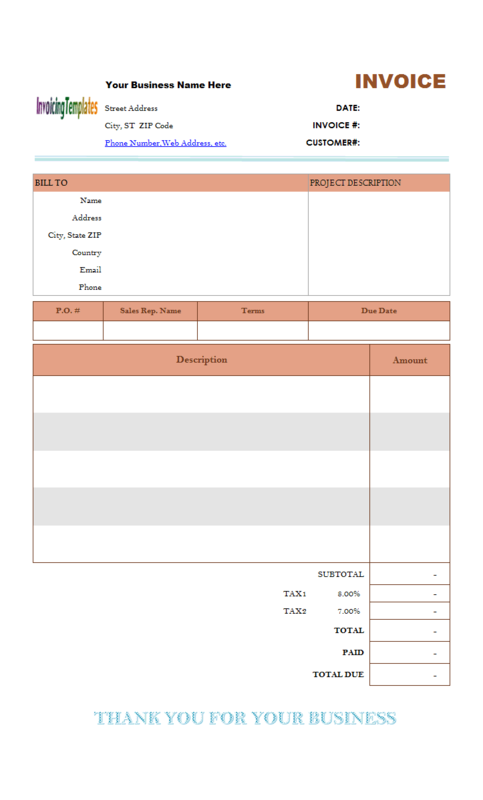 In this case, you may need to click Excel menu "File" and then "Print" to verify how many pages needed to print the form. Adding a new line is not as easy as hiding a line. Fortunately you can download ready-to-use templates at templates with multiple pages without going through all these steps. 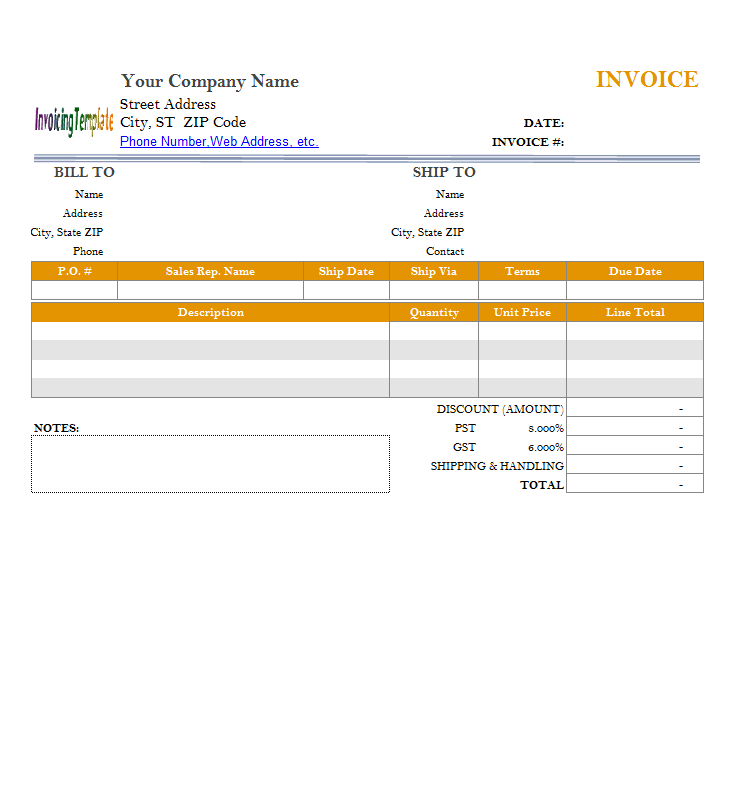 Like other form designs here on InvoicingTemplate.com, Tutorial for Adding New Line to Invoice Form is free (offered to you at a price of 0.00USD). It works on Windows XP and all newer versions of Windows, and Excel 2007, 2010, 2013, 2016 or 2019.